A wheelchair-bound teen who went viral after his photographer uncle shared a photo of him standing for the flag is in the news again, as a veteran-owned company who saw the photo has stepped forward to gift him with a standing wheelchair. Arek Trenholm, of Lake County, Florida, was born with spina bifida, a birth defect that causes incomplete closing of the backbone and membranes around the spinal cord. The 16-year-old has only stood from his chair two times in the last seven years, Fox 35 Orlando reported, with one of those occasions occurring when headlines were dominated by athletes choosing to kneel during the playing of the national anthem. 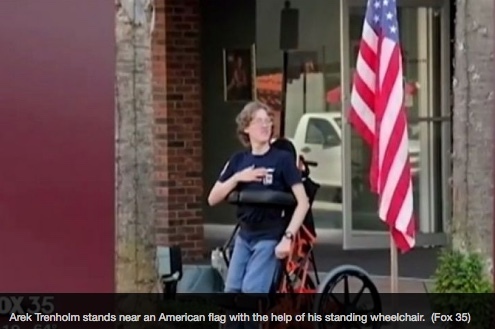 Trenholm was commended nationwide for his efforts to stand during his town’s homecoming parade as the flag passed him. Veteran Scott Liesch came across the photo of Trenholm and presented it to his employers at The Standing Company, who are also fellow veterans. The Michigan-based group decided to surprise Trenholm with a standing wheelchair to help him gain more independence and be able to stand upright more easily, Fox 35 reported.